Ragini sits in centre of all. Her face shines in happiness. Sanskar looks at her from distance and admires her. Swara applies mehandi for her. Janaki, “will you both stop teasing my daughter.” Swara and Mansi,”ooohhh”. All laughs at Ragini. Sujata, “Sanskar, you should find your name in Ragini’s hand.” Laksh pushes Sanskar. He came near to Ragini with smile and sits near to her. Ragini shows her hand to him. At first Sanskar shocked to see her hand and thinks, “what is this? Fully curves. Is this mehandi.” Then, he somehow brightens his eyesight and hold Ragini’s hand. He points towards his name in her hand. Ragini in happiness embaraced him infront of everyone by kissing his cheeks. Laksh, Mansi and Swara,”oh god, please bring day after tomorrow quickly.” RagSan blushed. Next day, Sanskar and Ragini dance together in their sangeet function. SwaLak, Sehjan and ramsuj dance around them. Mansi look at them in happiness. Next day, their wedding. They went to mandap. Laksh brings Sanskar and Swara brings Ragini. All are very very happy. RagSan sit infront of Agni and Pandit sit aside. Both take pheras and atlast Sanskar ties mangalsutra in her neck and applies sindoor to her. Ragini took her mangalsutra and look at it with tears and she look at Sanskar. All shower flower on them. It’s time for Ragini family to leave. Ragini look at them sadly. Tears fall from her eyes. Janaki,”Beta, you should takecare of Sanskar and help Mansi. You should never do any mistake and adjust with Sanskar. Take care of you.” She hugs her with tears. Next Swara,” I never told this to you in my life, i wish to tell this now. I love you didi. I will miss you.” Ragini, ” Swara, i love you too baby. I will miss you. You should study well and take care of mumma and pappa.” Both hugs each other. Then Shekar look at her with tears. Both hugged. Then she hugged Sujata. Sanskar,” i will take care of my princess more than you all.” Mansi, “She is like sister to me. However, we are near to you only na. Whenever you wish you can see her.” Ragini’s family left Sanskar house with heavy heart. Sanskar, “Ragini, i am with you na. If you wish, you can go to your home daily.” Ragini’s mood didn’t change. He takes her hand and caressed her palm, “Ragini, did you remember my proposal.” She think that moment. Ragini ties Swara’s eyes and both play hide and seek inside their home. SanLak went to Ragini’s home. Laksh went inside first and Sanskar came after parking the car. Ragini to escape from Swara she ran out. Sho lost her balance, Sanskar hold her waist, she turns to him angrily. Ragini shouts, “hey, idiot. How you can touch me? Who ask you to hold me?” She scolds him nonstop. Sanskar locked her lips with his and kissed her passionately. Ragini didn’t reciprocate but she stand like statute. Sanskar, ” I LOVE YOU RAGINI.” Ragini look at him in shock. Ragini smiles at him, “how i will forget that? How dare to kiss me on second meeting itself?”. Sanskar, “because i fall for you at first sight itself.” Sanskar is reliefed to see smile in her face. At 7 pm, Mansi called Sanskar and Ragini to have dinner. Ragini denies to eat food. Mansi,”have little Ragini.” She feeds her by force, from no where a soul enter into Ragini’s body and use her as medium. When Mansi fed her, tears escaped from her mesmerizing eyes. Unknown feeling occupied Mansi’s heart. I am sorry, if i confused in previous chapter. I am telling now also. 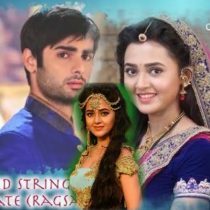 Ragini is daughter of Shekar and Janaki, Sister of Swara. Laksh and his family is family friends of Ragini’s family. Sanskar is orphan. Mansi is brought by his parents, who is their family care takers daughter. Mansi is like sister to Sanskar. I think i cleared your doubt.